← Do I Know You? 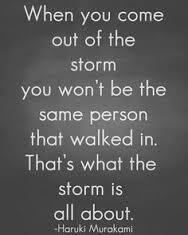 Our storms in life are the difficulties we experience and through them great change can evolve. Some storms change YOU so much that you may find yourself going in a direction you never would have chosen, not for any other reason than you weren’t in a place that was in alignment with it before. These new directions are beyond the familiar and can feel scary but at the same time exhilarating at the prospect of what is to come. Change is not always comfortable especially when it comes to the unknown which means you have to have faith that things will work out as they should and trust that it will be in your best interests. Having faith when you feel a little scared and somewhat skeptical can be a big leap but every time I’ve felt that kind of fear and anticipation it has ALWAYS turned out to be something great, a result that I couldn’t have planned better. I think that kind of anticipatory fear is the “little sign” for me that something big is to come, it may be different for you but pay attention to what your instincts tell you so you can learn when positive change is knocking at your door. Change can be especially difficult for you if you are headstrong about having control over the direction your life is going, it’s not easy to relinquish it to faith or trust when you are used to being the guide. I can tell you though that it is always well worth it to have faith, even it at first you don’t understand eventually things make sense, so much so that you may wonder how you didn’t get it earlier. New beginnings, new chapters, new paths all start with new thoughts and ideas and those thoughts are usually brought about by something that isn’t working for you any longer in your life. You may seek to shake up some part or all of your life because you’ve come to a point where feel that there is something bigger you should be doing. That is your purpose calling on you because you are finally within the range of alignment and the Universe assists by awakening that passion within your energy. I do believe that anyone in search of a better life can entirely change everything around, one can walk into a new direction that inspires and cultivates positive attitude, behaviour and lifestyle simply by making that decision and then by following through. It takes dedication, determination, focus and discipline to carry out and continue on the path you desire and that takes more work than you can imagine but as you know anything worth having is worth working for. It’s so easy to make a decision to do or change something, it’s another thing entirely to act on it and especially keeping up the momentum to see it through to the end. I’ve at times made a change and then stopped because it seemed impossible but what I’ve learned is that this fear is created by my ego in an effort to keep me from progressing. Progression like this builds up the strength of your inner spirit and your inner spirit is not in any way connected to your ego. As the inner spirit gets stronger the ego diminishes because it is not needed within the state of inner peace and balance. 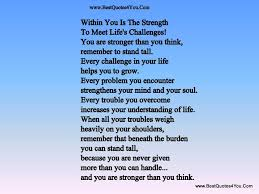 Strengthening that part of your being is the best asset you have in helping you succeed in any and all areas of your life. So in the end, the storms even though they are not desirable, are necessary to your personal growth, awareness and understanding of your soul and the Universe. Know that they are not meant as punishment, they are to provide a higher learning. Imagine that you are in a boat on the ocean in a real storm, what you learn in that scenario is no different than what you learn through your personal storms, we learn to navigate to survive so we can live another day.